Roger Federer, with his cricket skills, drew comparisons to Sachin Tendulkar as he came up with a graceful forward defence during his fourth-round match at Wimbledon on Monday. Check out reactions here. 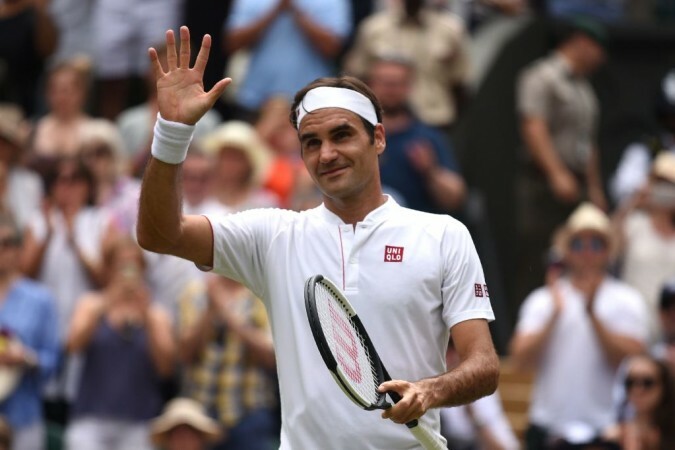 Roger Federer is mesmerising tennis fans with his near-perfect displays at Wimbledon 2018 but on Monday, June 9, the Swiss great caught the attention of cricket enthusiasts with a textbook forward defence on the grass-courts of the All England Tennis Club. The 20-time Grand Slam champion was in a ruthless mode as he faced 22nd seed Adrian Mannarino in the fourth round of his title defence at The Championships. Before unleashing those stunning forehand returns and passes against the Frenchman, the eight-time champion showcased the cricketer in him while directing a dead ball to the ball boys at SW19. Federer was up 2-0 in the first set when he overhit a backhand. And when Mannarino returned the ball to the other end, the tennis legend gracefully put his right foot forward and stopped the ball by holding the racquet face perpendicular to the ground. The classy act reminded cricket fans, especially the one who handled Wimbledon's social media page, of batting great Sachin Tendulkar. The official Twitter page of the tournament mentioned the International Cricket Council in its post and asked the governing body to rate Federer's shot. The ICC's Twitter handle came up with an equally interesting post in reply to Wimbledon. Describing Federer's shot, ICC wrote on its website: "Furthermore, it was straight out the middle of the strings. It would a lot of chat from the slip cordon to get an edge out of this legend! Here's to seeing Roger pull off the Dilscoop in his quarter-final." Cricket skills aside, Federer was in red-hot form on Monday as he bageled Mannarino in a 16-minute first set before wrapping up the match in three sets. The 36-year-old will face South Africa's Kevin Anderson in what will be his 16th Wimbledon quarter-final later this week. Federer has now won 32 sets on the trot at Wimbledon and his two away from his equalling his record of 34 that he had achieved between 2005 and 2006. Okay, how good was Federer? Here's the cricket great's forward defence to help you decide.